6.4L - Manual Transmission - Mopar Performance is proud to bring your Dodge Challenger a genuine Mopar Performance OEM Cat Back Exhaust System. 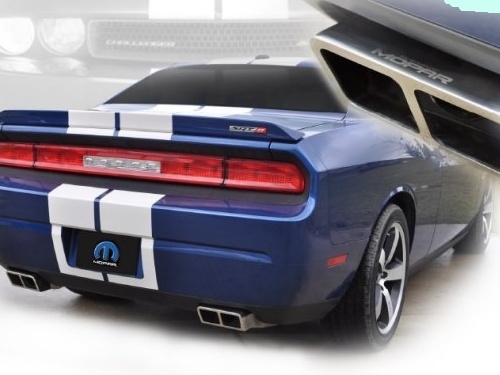 A Dodge Challenger Cat Back Exhaust System is a fairly simple power modification that will increase your Challenger's exhaust gas flow and produce an engine sound that is deeper and more powerful than that of your stock muffler. Adding a Cat Back Exhaust provides several benefits, the first of which is more power. This Dodge Challenger Cat Back Exhaust System is designed to be freer flowing than your stock exhaust, incorporating larger diameter piping and higher-grade mandrel bent tubing for a more laminar flow. What this means for you is a reduced level of back pressure at the engine manifold, so your engine can breathe a little easier and release more horsepower and torque. This also leads to an increase in fuel economy after installing a Cat Back Exhaust System. Another big benefit of a Cat Back Exhaust System is the sound it produces. From a little more grunt to a full-on growl, you'll definitely notice the difference in your Challenger's sound after installing this Exhaust System.